Ideal for those seeking both good looks and durability in a portfolio. 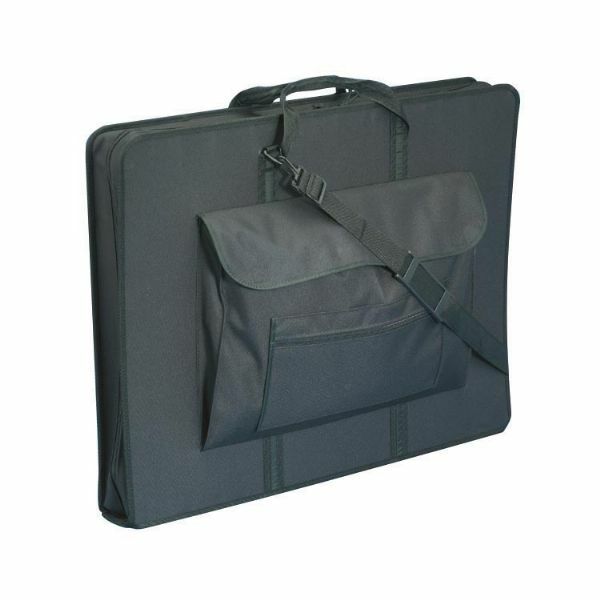 This attractive portfolio is constructed of reinforced nylon laminated to corrugated plastic. Features a 4" wide gusset, four protective chrome studs on the bottom, two full-width inside pockets and twin zippers that open fully on all three sides. Features a 5" x 17" interior pencil and brush storage case and a 14" x 21" x 2" exterior front pocket with smaller zippered pocket on top. Dual handles, ID/business card holder, and detachable shoulder strap for comfortably carrying a full portfolio of work. 99 points will be rewarded when you are logged in to your account and buy this item.